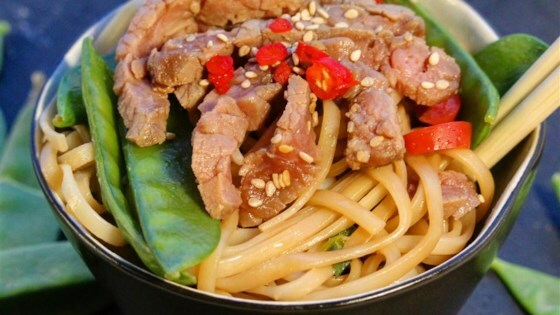 "A delicious combination of Asian flavors infused in lean meat, vegetables, and Japanese noodles. So comforting, you won't even know this was low-fat!" Whisk soy sauce, vegetable oil, brown sugar, ginger, and garlic powder together in a large bowl. Pierce flank steak several times with a large fork. Place in the bowl and cover with plastic wrap. Let marinate in the refrigerator, at least 4 hours and up to overnight. Bring a large pot of salted water to a boil. Cook udon noodles in boiling water, stirring occasionally, until tender yet firm to the bite, 13 to 14 minutes. Drain. Heat a large skillet over high heat. Remove steak from marinade and cook until well-browned, about 2 minutes per side. Reserve marinade. Preheat grill for medium heat and lightly oil the grate. Grill steak, basting with half of the reserved marinade, until internal temperature reaches 140 degrees F (60 degrees C) for medium or 150 degrees F (65 degrees C) for medium-well, at least 10 minutes per side. Slice steak thinly against the grain. Combine remaining marinade, snow peas, broccoli florets, and mirin in the skillet. Cook and stir over medium-high heat until snow peas are tender, about 2 minutes. Add drained noodles; mix well to combine. Divide noodle mixture among large bowls. Top with steak slices. Flank steak is best when served medium or medium-well. Medium-rare will be too tough to chew. I would like it spicier. Otherwise very good, great base, will make again. My family loves this meal!! We add water chestnuts and bamboo shoots. We're constantly finding tweaks we can make. I've made this about 4 times, and it is requested often. This was good the night I made it, but I enjoyed it much more the next day. I will keep this in the rotation.